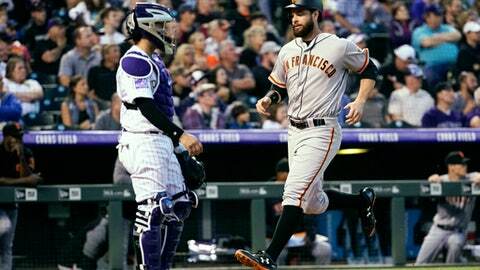 DENVER (AP) The month of May was a big hit for Brandon Crawford. The Giants’ bullpen allowed three hits the rest of the way, with Hunter Strickland getting Arenado to pop up with two on to end the game and earn his 11th save. Jon Gray turned in his shortest outing of the season at 3 1/3 innings. He walked two straight batters with the bases loaded in the fourth to allow the Giants tie the score at 4. Musgrave entered and the Rockies got out of the tight spot when Andrew McCutchen’s liner was dropped by Trevor Story, who then began a double play. Giants: RHP Jeff Samardzija was placed on the 10-day disabled list with shoulder tightness. … INF Joe Panik (left thumb) could return to the Giants on Friday. … RHP Mark Melancon (elbow) will be evaluated Thursday. Rockies: 2B DJ LeMahieu (left thumb) took multiple at-bats in Arizona on Wednesday. ”He’s doing really well. He’s close,” manager Bud Black said. Possibly activated Friday? ”You can speculate. I’m not going to tell you. But you can speculate it a lot,” Black said. She’s also delivered pitches at Baltimore, Washington, San Diego, San Francisco, Chicago Cubs, Texas, Cleveland, and during Game 4 of the 2017 World Series in Houston. Several Rockies players signed her prosthetic hand, including Ian Desmond, Arenado and Gonzalez.